Every year there seems to be a new cutting-edge diet or exercise that emerges and tells us that, what we are currently doing needs a change. Unfortunately, many of these health fads fade away as the newest philosophy or study takes the stage. Let’s be honest, it’s hard to keep track of all the health dos and don’ts we read on the Internet. Sometimes, they are better off being ignored. 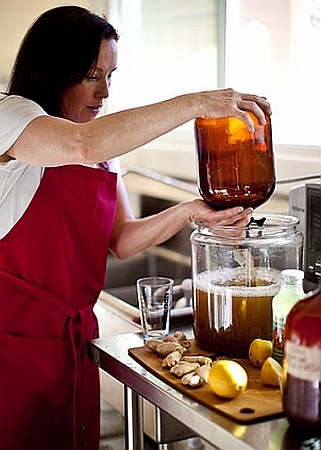 One trend that shouldn’t be ignored, but in fact recognized is Kombucha on tap. It is growing in popularity and popping up in health food markets all over the United States. 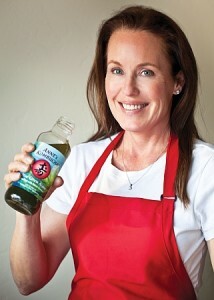 We are proud to offer Anne's Kombucha onb Tap throughout San Diego, Temecula and Southern California. See where it's offered on tap and learn more about www.KombuchaOnTap.net. Health food markets have discovered a social aspect of drinking Kombucha among the health conscious demographic. Yogis, athletes and health conscious people are getting together and enjoying pints of Kombucha similar to the way many enjoy pints at the pub. It’s a way to be social without experiencing the detrimental health effects of alcohol. This trend has grown so much over the past few years that even bars are carrying it for the social individuals who don’t want to get intoxicated. Just like beer, Kombucha tastes more sparkling and alive on tap. Unlike beer, Kombucha has many health benefits. Kombucha from the tap provides you with all the same wonderful nutrients but with much more effervescence, than Kombucha from the bottle has to offer. When you drink from the tap, you are taking in all the nutritious acids and friendly bacterium naturally existing in Kombucha. You are also helping the environment because many places that offer Kombucha on tap provide you with a reusable or recycled container. It’s a win-win, protect your body and protect the environment. Kombucha is perfect after a morning yoga session or with friends on the weekend. If you’re a Kombucha fan or if you’re in the mood to try something different and healthy, grab a glass of Kombucha on tap and taste a drink that everyone is craving. At Anne’s Kombucha we are kombucha connoisseurs, so we want to introduce you to you some popular kombucha flavors. Of course Anne’s Kombucha is our favorite kombucha so we will take you through some popular kombucha flavors that we make, but there are some other flavors out there that we enjoy as well. 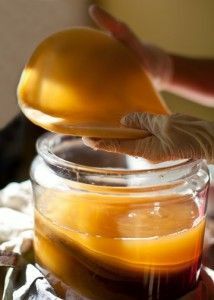 There are many varieties of kombucha and all of them have a unique flavor and quality based on the brewing process and ingredients. Enjoy! 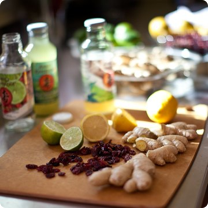 Ginger is not only a popular kombucha flavor for its unique flavor profile but also for its healing abilities that have been used since ancient times. For over 2000 years, Chinese medicine has recommended the use of ginger to promote energy circulation in the body and increase our body’s metabolic rate. Other reported benefits includes effectiveness for reducing nausea and digestion issues, as well as improving absorption of stimulation of essential nutrients in the body. Ginger is also an anti-inflammatory and a natural powerful painkiller. It strengthens the immune system. The organic freshly pressed ginger root in Anne’s Ginger Kombucha adds spice and slightly sweet notes to this kombucha tea. This was the very first kombucha flavor we made over 6 years ago and is still our personal everyday beverage. We just love ginger!!! Blue green algae is one of most nutrient dense foods on the planet and it has been dubbed as a superfood. In Anne’s Kombucha we include Wildcrafted Organic Klamath Blue Green Algae, USP Certified Organic Spirulina, and Super Soft Cell Wall Chlorella all of which contains vitamins, minerals, simple carbohydrates, lipids and biologically active enzymes that are great for your health. Blue Green Algae is 70% vegetable protein and contains a high concentration of nutrients – over 65 vitamins, minerals and enzymes and the complete spectrum of eight essential amino acids and ten nonessential amino acids…and they are all easily absorbed by the body. It has a slightly natural sweet taste, beautiful blue-green color. Our personal experience has been to drink half the bottle 45 minutes to 1 hour before working out and the remainder within 60 minutes after exercising. Love it and love the results! The combination of organic cranberries and organic lime in this popular kombucha flavor is the perfect combination to wake up your senses and energize your day! Cranberries are full of antioxidants, which protects cells from damage by unstable molecules called free radicals. Drinking cranberry juice has been shown to block urinary infections by binding to bacterial so they can’t adhere to cell walls. The National Institutes for Health is funding research on the cranberry’s effects on heart disease, yeast infections, its potential against cancer, stroke and viral infections. We use organic dried cranberries lightly coated with organic sunflower oil and organic apple juice to balance the tart flavor. We think this is one you will enjoy especially as an afternoon non-alcoholic beverage. We love pineapples for their sweet and tart tropical flavor, so it was a no-brainer to infuse this awesome flavor into our Kombucha. We add organic raw pineapple, blended in our Vitamix and mix it with our Kombucha Tea base to make this flavor stand out. In addition to being a popular and delicious flavor, raw pineapple is an excellent source of vitamin C and manganese, a mineral necessary to build bones and connective tissues as well as bomelain enzymes to help prevent bruising and reduce age spots and fine lines. It lessens the risk of hypertension, maintains good eye health, prevents plaque and keep teeth health, is effective in reducing constipation and irregular bowel movements. Pineapple contains enzymes that make skin elastic, improve skin hydration, and remove damaged and dead cells. Thus, it helps us achieve a clear and glowing complexion. It’s a wonderful flavor for non-Kombucha drinkers or children who are not used to the sweet and sour taste of a tradition Kombucha Tea. There is nothing more refreshing on a hot summer day than a nice cold watermelon, and the same goes for this refreshing flavor of Anne’s Kombucha. One of the main health benefits of watermelon is its status as a powerful antioxidant, found in vitamins A & C, which helps to neutralize free radicals that can lead to inflammation, general sickness and chronic illnesses such as stroke or heart attack. 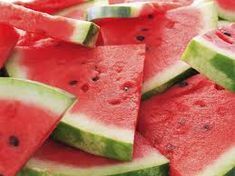 Lycopene, a carotenoid found in abundance in watermelon provides additional cancer fighting health benefits of watermelon. 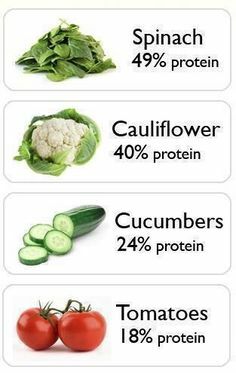 It is also known to have fat burning benefits due to its high water content which makes your metabolism work more efficiently. In this flavor, the ginger gives some soft heat while the watermelon adds a refreshing sweetness. Its perfect harmony makes watermelon ginger a very popular kombucha flavor! 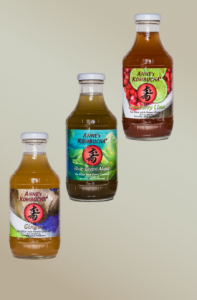 Not only are the flavors of Anne’s Kombucha delicious, but they are also as healthy as you can get! Anne’s Kombucha is gluten free and does not contain any GMOs, colors, preservatives, or artificial sweeteners. Bottoms up! What are probiotics and what are the benefits of probiotics? Anne’s Kombucha is loaded with probiotics, so we want to give an intro into the world of probiotics and what they mean for your body. Kombucha is essentially made up of a living culture of microorganisms that are beneficial to your health. The probiotic content in Anne’s Kombucha is over one billion organisms, so we feel like we should explain what that means for your body and health. Probiotics are live microorganisms that help maintain the natural balance of the intestines. Basically, probiotics keep in check the amount of harmful bacteria in our stomach and intestines—kind of like little warriors keeping harmful bacteria at bay. Many probiotic foods are produced by the action of yeasts, lactic acid bacteria, or a combination of both. If you think you have never eaten food with probiotics, think again! Probiotics are commonly found in fermented foods with added active live cultures such as yogurt and soy yogurt. Perhaps you are familiar with probiotics in yogurt by another name—acidophilus—a variety of probiotic. Probiotics are also found in other fermented foods such as miso, kimchi, tempeh, sauerkraut, kefir, and of course, kombucha! Because of the health benefits of probiotics, they are also available in pill form as a dietary supplement. The health benefits of probiotics are plenty. Many benefits of probiotics relate to the digestive system, but scientists are studying how probiotics may have a positive influence in the prevention and treatment of several very serious diseases such as diabetes, heart disease and cancer. Not only are probiotics known to help with the above ailments, but they are also connected with preventative benefits as well. Probiotics are noted to enhance mood, fight allergies, boost immunity, and detoxify the body. Probiotics have also been related to reducing or eliminating symptoms of depression, fibromyalgia, and anxiety. A great way to get in on the wonderful health benefits of probiotics is to incorporate them into your diet. Pick up some up Anne’s Kombucha at Whole Foods, Jimbos or other local markets and get those one billion lactobacillus bacterium working for your health. Your body will thank you!